NEW YORK, New York, August 30, 2010 (ENS) – The Intergovernmental Panel on Climate Change “needs to fundamentally reform its management structure and strengthen its procedures,” finds a report issued today by the InterAcademy Council, an Amsterdam-based organization of the world’s science academies. While the process used by the Nobel Prize-winning IPCC to produce its climate science assessment reports has been “successful overall,” the council recommends that the panel’s chair, working group co-chairs and a newly proposed executive director all be limited to the term of one assessment – about seven years. “This recommendation is not in any way motivated by an evaluation of the current leadership of IPCC. Such an evaluation was beyond our charge. 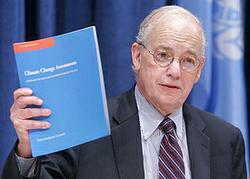 Rather, this recommendation has to do with ensuring a variety or perspectives at the top as well as maintaining the overall vitality of the assessment process,” said Harold Shapiro, president emeritus and professor of economics and public affairs at Princeton University and chair of the committee that wrote the report. UN Secretary-General Ban Ki-moon and IPCC Chairman Rajendra Pachauri of India welcomed the council’s report, which they jointly requested back in March. At a news conference at UN Headquarters in New York today, Pachauri called the recommendations “forward-looking” and said that IPCC member governments will review them at the panel’s October plenary meeting in Busan, South Korea. Pachauri, who has served as IPCC chair since 2002, said he was elected to carry out the IPCC’s Fifth Assessment Report, due in 2013 and 2014, but said he will step down if the governments meeting in Busan request that he do so. The council also recommended that “a rigorous conflict-of-interest policy be developed and applied to senior IPCC leadership and all authors, review editors, and staff responsible for report content,” said Shapiro. “It was beyond our charge to review the conflict-of-interest controversies that have been reported in the press, but we did note that the lack of a conflict-of-interest policy was troubling to many of the stakeholders we heard from, and that many government and nongovernment institutions that conduct assessments or provide scientific advice have adopted such policies to assure the integrity of, and public confidence in, their results,” he said. 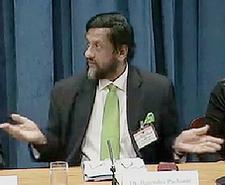 Dr. Pachauri stressed that the IAC review is the seventh climate science review conducted this year. “By overwhelming consensus, the scientific community agrees that climate change is real. Greenhouse gases have increased markedly as a result of human activities and now far exceed pre-industrial values,” said Pachauri, an industrial engineer, economist and university professor and has advised the government of India, corporations and nongovernmental organizations. “My hope is that the accumulation of so many investigations into climate science in such a short period of time will strengthen public trust so that we can move forward,” he said. Pachauri said experts on climate change remain “fully engaged” and enthusiastic about tackling complex issues as demonstrated by a doubling of the number of scientists nominated to work on the next assessment report. “The number of nominations to work on AR5 increased 50 percent to about 3,000. From those, we selected 831 experts, compared with 559 in 2004. What a tremendous show of support,” he said. These experts were selected from fields including meteorology, engineering, biology, physics, oceanography, statistics and economics and they represent a broad diversity of geographic locations and viewpoints, Pachauri said. “It was beyond our charge to review the conflict-of-interest controversies that have been reported in the press, but we did note that the lack of a conflict-of-interest policy was troubling to many of the stakeholders we heard from, and that many government and nongovernment institutions that conduct assessments or provide scientific advice have adopted such policies to assure the integrity of, and public confidence in, their results,” Shapiro told reporters. The IPCC was established in 1988 by the World Meteorological Organization and the United Nations Environment Programme to inform climate policy decisions through assessments of the physical scientific aspects of climate change, its global and regional impacts, and options for adaptation and mitigation. 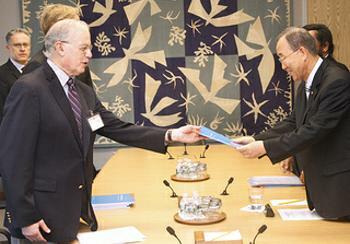 The IPCC conducts no original research but reviews and assesses the existing scientific literature. Representatives of 194 governments make up the panel, which sets the scope of the assessments, elects the bureau that oversees them, and approves the Summaries for Policymakers that accompany the massive assessment reports, which are prepared by thousands of scientists from around the world who volunteer for three working groups. These assessment reports have gained IPCC much respect including a share of the 2007 Nobel Peace Prize with former U.S. Vice President Al Gore. But amidst an contentious public debate about the science of climate change and costs of limiting the planet’s rising temperature, controversies have erupted over the IPCC’s perceived impartiality and the accuracy of its reports. In its report, the council recommends that the IPCC should elect a small executive committee to act on its behalf in order to maintain a year-round, ongoing decision-making capability. “This committee should include members from outside IPCC or even outside the climate science community in order to give it more credibility and independence,” Shapiro suggested today.